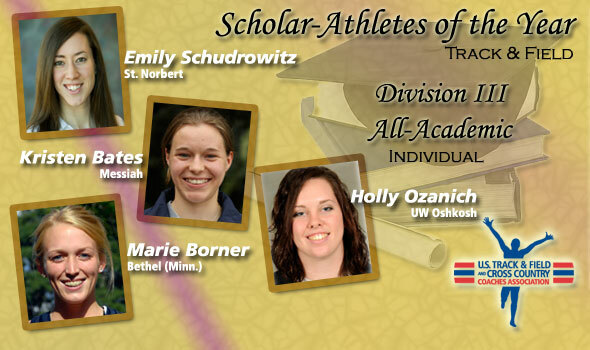 NEW ORLEANS – Emily Schudrowitz (St. Norbert), Kristen Bates (Messiah), Marie Borner (Bethel (Minn.)), and Holly Ozanich (UW Oshkosh) were named on Friday as Scholar Athletes of the Year in Division III for the 2010 track & field seasons by the U.S. Track & Field and Cross Country Coaches Association (USTFCCCA). The four represents collegiate track & field’s best in both athletics and academics. In addition, 330 were tapped as USTFCCCA All-Academic honorees. Schudrowitz, a native of Wauwatosa, Wis., was the NCAA Division III indoor champion at 800 meters this March. Schudrowitz, a sophomore this year, holds a 3.91 cumulative GPA in the field of international business. Bates, a native of Landisburg, Pa., gained NCAA indoor titles in the pentathlon and 55-meter hurdles. In addition, Bates returned for the outdoor NCAA Championships to win the 100-meter hurdle crown. Bates, a psychology major, tallied a 3.80 cumulative GPA through the 2010 winter term. Borner, a native of Cottage Grove, Minn., won NCAA crowns in the 800 and 1500 meters at the national outdoor championships in May. For Borner, it was her second-straight title in the 1500 and her sixth overall NCAA championship. Borner, claiming a 3.49 cumulative GPA in exercise science, also won the national title in the indoor mile in 2010. Ozanich, a native of Green Bay, Wis., was the NCAA hammer throw champion in May, claiming UW Oshkosh’s fourth-straight national crown in the event. Ozanich, a junior studying biology, holds a 3.73 cumulative GPA. In addition to the Scholar Athletes of the Year, the USTFCCCA also announced the women’s 2010 Division III All-Academic Track & Field team. A total of 330 student-athletes representing 99 institutions compose the group. Wartburg led all squads with 12 earning All-Academic status. Calvin notched 10 for the second-highest total. Conference leaders include the MIAC who claimed 48 on the list and the WIAC with 37. National champions Alyssa Pirinelli (St. Lawrence), Rachel Boerner (Calvin), Nikki Hay (Springfield), Callen Martin (Wilmington (Ohio)), Jacqui Wentz (MIT), and Amanda Trieloff (Carroll (Wis.)) joined those who won Scholar Athlete of the Year honors as All-Academic honorees. Fourteen All-Academic honorees were reported to have cumulative GPAs of 4.0 and above. To qualify for the USTFCCCA All-Academic Track and Field Team, the student-athlete must have compiled a cumulative grade point average of 3.30 and have met either the NCAA Division III indoor or outdoor automatic or provisional qualifying standard. Those institutions given All-Academic Team status will be named on Tuesday, August 3 (men) and Wednesday, August 4 (women).